What qualities make you special? How about a friend or relative? 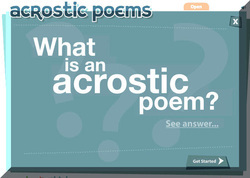 You can write an acrostic poem to to share some of the amazing qualities or interests of your chosen topic! Try to create an Acrostic Poem of your own! One form of poetry is a diamente poem. These special poems are in the shape of a diamond and can compare synonyms or antonyms through a unique structure and choice of words. 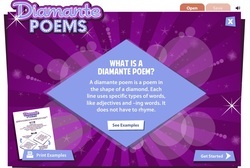 Check out these Diamante Poems from ReadWriteThink. How do you write a good poem? Why not consult with Jack Prelutsky, an acclaimed author of children's poetry? Check out some of Mr. Prelutsky's poems and some great suggestions that can be helpful as you grow as poet. Just go to the Poetry Writing page to begin!